Clean, unencumbered modern design and outstanding light performance distinguishes Taag high output LED wall packs by Tech Lighting. Intended for outdoor security and outdoor general illumination, Taag wall packs blend design with performance. the Taag 6 delivers 765 lumens of light output in commercial and/or residential applications for which powerful illumination is required. The contemporary Taag sconce design is available in two sizes. Taag 10 which is 10 inches tall, and the Taag 6 which is 6 inches tall. 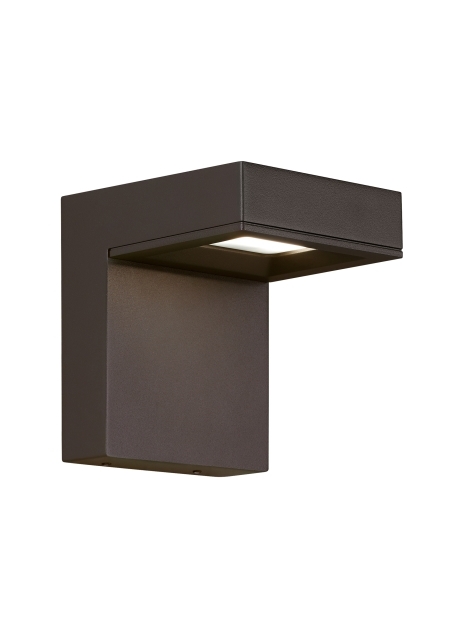 These powerful outdoor light fixture features a durable, marine grade powder coat finish available in two finishes. Charcoal or Bronze. Taag wall scones feature stainless steel hardware and impact-resistant, UV stabilized acrylic lensing for added durability and stability. Powerful, long lasting (L70, 70,000 hours) dimmable LED tested against the highest quality standards to ensure it delivers consistent LED performance and color over time. Die-cast aluminum structure, marine-grade powder coat finish, and stainless steel hardware for robust durability in harsh elements. appropriate for commercial use. Wet listed, IP65 (International Protection rating indicating resistance to dust and water. suitable and safe for commercial use). 5-year Warranty. Go to www.techlighting.com for warranty details. Length -- Choose -- 6"